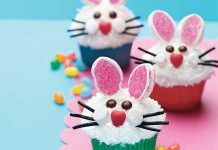 Easter is just around the corner and even though different cultures had different takes on the holiday, in commonality, all celebrate new life. 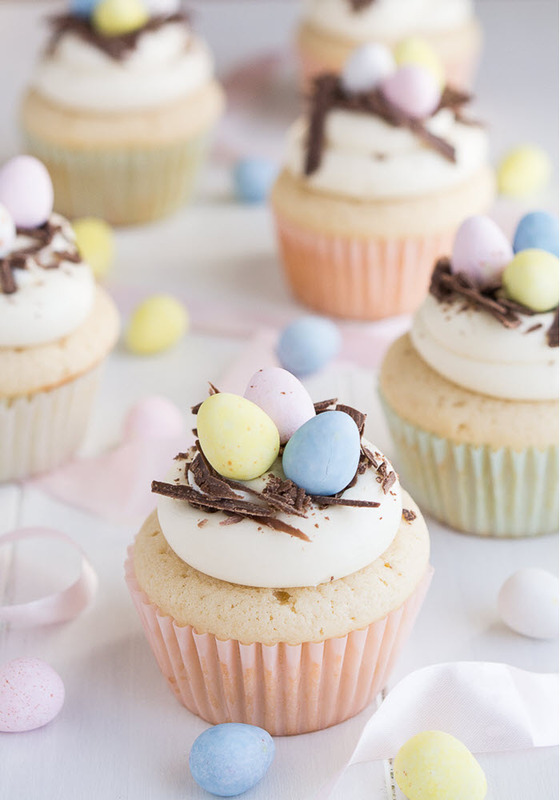 Today, we take a look of some of the easiest yet best tasting Easter egg cupcake recipes. 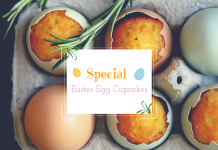 We have more than enough recipes in line for today that can inspire everyone even the novice bakers to prepare for their own mouthwatering dessert this coming Easter. Preheat oven to 350. Use cupcake liners for muffin tins. Using a mixing bowl, combine the flour, baking soda, baking powder, and salt. In a separate bowl, pour the butter and beat in the buttermilk, sour cream, sugar, and vanilla. Whisk I the dry ingredients to liquid, and mix the batter until combined. Set aside. Using an electric mixer, beat egg whites until it reaches peak form. Fold into the cupcake batter until well-mixed. Using an ice cream scoop, spoon batter into the cupcake liners. Place the muffin tins to the oven, and bake for 15-18 minutes. Remove to wire racks, and let the cupcakes cool completely. Using the microwave set on low temp, melt the white chocolate chips. Let the melted chocolate cool slightly (about 2 mins). Beat together cream cheese and butter in a mixing bowl using medium speed (about 1 min). Add the vanilla and melted white chocolates to the mixture and beat again (another 1 min). Whisk in the sugar slowly, and mix until light and fluffy. Add the milk gradually until the frosting reaches the desired consistency. Pour the frosting in a piping bag, and pipe onto the cooled cupcakes. Shave the chocolate bars to create thin and long chocolate bits. 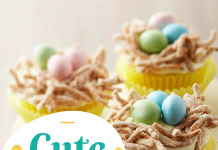 Sprinkle the chocolate shavings over the freshly piped cupcakes. 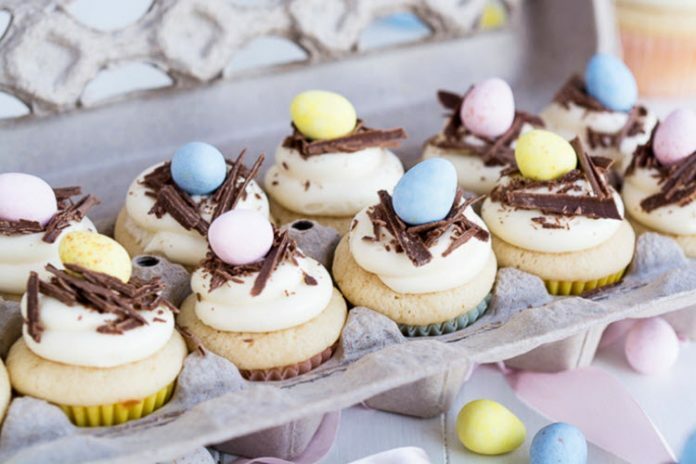 Top the sprinkled cupcakes with Cadbury mini chocolate eggs. Preheat oven to 350. Use 24 mini cupcake liners for mini muffin tins. Mix together the flour, baking soda, baking powder, and salt in a medium-sized bowl. Set aside. Melt the butter in a large microwavable bowl. Mix in the sugar. Consequently, beat in the egg whites, milk, yogurt, and vanilla bean until well combined. Fold in dry ingredients into the wet ingredients and mix well. Pour in batter into the 24 mini cupcake liners. Place in the oven and bake for about 10 minutes. Allow the mini cupcakes to cool completely. 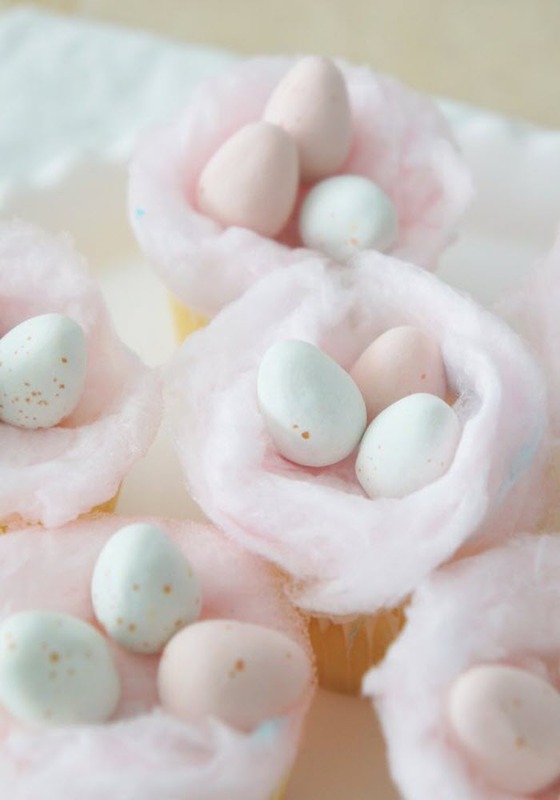 Make some little nests out of cotton candy, and place them on top of the cooled mini cupcakes. Place the Cadbury mini eggs on each nest. Preheat oven to 350. Line the pans with cupcake liners. Combine the flour, cocoa powder, baking powder, baking soda, and salt in a medium bowl. Set aside. Using a large bowl, mix together the eggs, sugar, oil, buttermilk, brown sugar, and vanilla extract. Fold in the half of the dry ingredients into the wet and stir carefully. Right after, add the other half and mix well (but don’t overmix the batter). Fill the cupcake liners with 2/3 of the batter. Place the cupcakes in the oven, and bake for 18-22 minutes. Using a large bowl, beat the butter until it smoothens. Add the 1 tbsp milk, vanilla, malt powder, and cocoa. Beat again. Mix in the powdered sugar at a time until the frosting reaches the desired texture. Add more milk if the frosting gets too thick. Piped the frosting on cooled cupcakes. Place the Whopper Eggs on top of the frosting, right at the center. Preheat oven to 350. Place cupcake liners on cupcake pan. Using a large bowl, beat together the sugar and butter. Slowly add the eggs, egg white, and vanilla. In a separate bowl, mix together the flour, salt, and baking powder. Pour ½ of the flour mixture to the butter mixture. Slowly add the milk. Them add the remaining dry ingredients. Beat together until smooth. Spoon each liner with 2/3 of the cupcake batter. 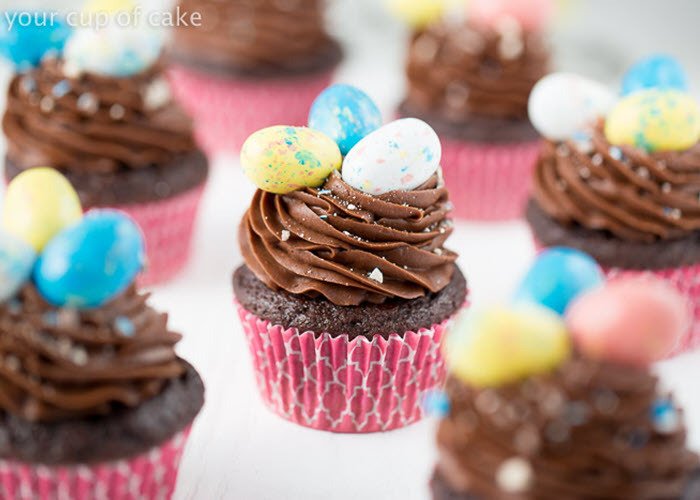 Press 1 Hershey’s mini chocolate eggs into each cupcake. 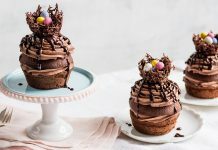 Chocolate eggs don’t need to be completely sunk in. 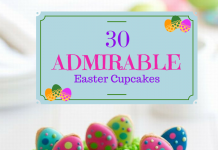 Place the cupcakes in the oven, and bake for 15-20 minutes. In a bowl, beat together the remaining butter and the powdered sugar until fluffy. Stir in milk and vanilla. Beat again until desired consistency. Divide evenly and pour the frosting into different bowls. 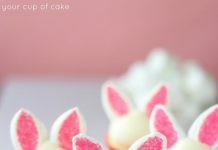 Add a few drops of food coloring into each frosting. 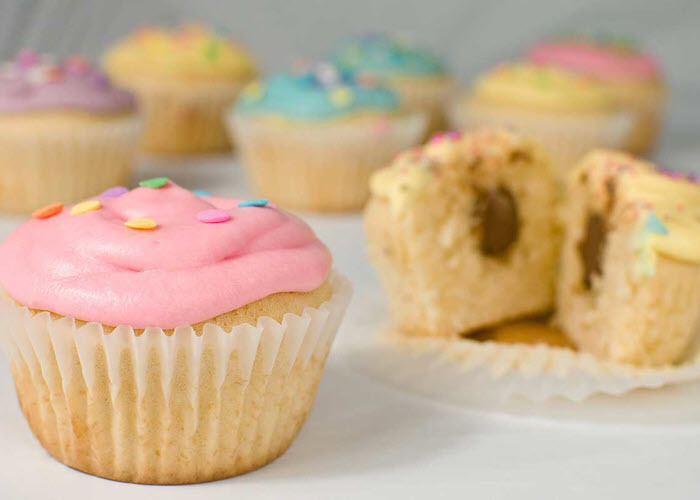 Spread or pipe the frosting on cooled cupcakes.